Sometimes people tell me I'm too rough on the President. It's not his fault that all that Fake Bake tanning lotion turns his skin orange. If you covered your body with that crap you'd be orange too. You can't blame him if he wears his tie as though it's 1974. Hey, if Lou Grant wore his tie like that, why can't Donald Trump? He's the President of the United States, they tell me, and if that's the case, I should show him some respect. Then I read that he spends 60% of his day on "Executive Time." He doesn't actually go to work until 11 AM. Now if I were cynical, I'd say that's a good thing. After all, the less time he spends working, the less damage he can cause. You know, with a job like President of the United States, you can cause a lot of damage, For example, even though he got three million fewer votes than his opponent, he's appointed two Supreme Court justices. In his defense, one of them did not appear to be rapey. Anyway, I've decided to follow in his footsteps, and I believe doing so will earn me the neverending gratitude of my students, most of whom hate Trump. This, though, might be the thing to win them over. Why not give all of our kids executive time? From all I can see, since everyone has the right to pursuit of happiness, my students ought not to be left out. 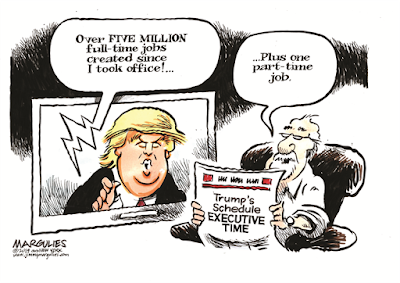 If their day is ten periods, six of them ought to be executive time. Or perhaps we'll only require them to be there 40% of each class. Despite what you read in the tabloids, teaching is a pretty goshdarn stressful job. Giving us 60% executive time will help a lot. For example, when you know your supervisor is coming around for a drive-by, you can simply take your executive time. The supervisor will be unable to give you a bad rating if you aren't there, and even if the voices in his head make him do so anyway, you can avail yourself of executive time whenever he wants to meet with you. Then it won't count anyway, since he gave you no feedback. With executive time, working people around the country can finally get the break they need. All those folks working at Walmart can take a few hours to see the world outside the superstore. Maybe parents who work 200 hours a week could spend 120 of them with their kids. In fact, by being a role model, maybe fewer people will hate Donald Trump. Instead of simply lying to everyone about infrastructure, about the wall, about how his tax cut would help people other than his uber-wealthy BFFs, he could say, "Hey, how about that executive time? Did Obama give you executive time? Did Hillary?" I, for one, am glad that the Commander in Chief finally had a good idea. Take a break, America. The President says it's okay.